I don't know about other readers, but I find myself frequently following trails of similarly themed books and reading through until I get it out of my system. So, in the wake of reading The Food of Love, I went in search of things Italian and food related on the bookcases - hence this post. I was given this book by a friend in the Abbey Girls group in Adelaide as a farewell gift when I moved back to Sydney. It's a memoir, a collection of wonderful recipes and a history of a migratory pattern of which I was quite unaware until I read it. Mary Contini's ancestors on both sides made the move from their poverty stricken, remote mountain villages in the Abruzzo region of Italy, south of Rome to - of all places - Scotland. Once there, they established themselves with mostly food related businesses, primarily fish and chip shops and ice creameries. It is typical of diaspora stories in that it relates the sense of dislocation for those making the original move, down through the generations of locally born children and grandchildren of a different but distinct ethnicity trying to fit in with the dominant culture. Holding the generations together is the food - in this particular family's case, both domestically and professionally. The book is written as a series of letters, each chapter focusing on one particular part of traditional southern Italian cuisine - pasta, meat, vegetables, etc. 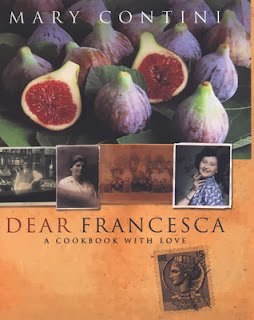 Francesca is Mary's daughter, who, like many of the grandchildren of migrants, distanced herself from her culture as a child, but as an adult finds herself looking for it - at least that's the impression gained in the reading. Each chapter is full of family anecdotes, stories of how the various couples met, the trips back and forth by those who did go back to Italy, food likes and dislikes, and homespun philosophy about teaching children to eat well by being inclusive in the kitchen. The recipes are lovely - good, simple authentic dishes that require, first and foremost, quality fresh ingredients - although, pretty short lists per recipe on the whole. Real Italian food is very simple, relying on the quality of fresh seasonal produce to speak for itself. In the past, my base cooking style at home was largely Italian and Chinese. These days, it's more Middle Eastern, because DB and Eighteen are training on and off constantly, so pasta is loved and then banned equally constantly, and I've not got into a groove of my regular dishes. But reading this book, and others in my collection, and I'm reminded how much I love the simplicity of Italian food - and tonight, my lot will be getting a pasta dish that will make working around a messy evening of people coming and going very easy, as well as being something I can put together from the pantry cupboard and the garden. And that last bit - THAT'S the real pleasure of books like this. I get something out of most books I read - some so much so that I re-read them regularly. This book transports me into a diaspora experience similar to that of my ancestors (albeit they were Jewish, not Italian) that is many generations back from my own childhood, and it also gives me the means of bringing some of the Italian experience into my kitchen. The Scottish connection is an oddity that I really enjoyed - we all know about the American Italian community, and in Australia we have a huge Italian community. Obviously, Italian migrants went other places, but I'd not have pulled Scotland out of a hat myself! It was published originally in 2002, so I don't know how easy it is to come by copies now, but if you can get your hands on a copy, and you want some fresh inspiration in your kitchen as well as a lovely read, try and find it. You might be surprised to know there's a similar Italian community in South Wales. Fish and chip shops and ice cream parlours again. Hi Georgina - thanks for that! Where I grew up in Sydney, it was the Greek immigrants who had the fish and chip shops and delis. When my family moved to Adelaide years later, we found a large Italian community but not so much with these particular commercial ventures - restaurants, cafes and delis yes, but not the fish and chips and/or ice cream combos.